This page is intended as a resource for members of the NTC Session Advisory Committee. This committee is being managed and supported by Ash Shepherd, Education Director. Slack Team: For quick and short communications we have set up a Slack Team with a channel for each phase. We can use this space to share updates, ask/answer questions, get reminders calendar reminders etc. If you are new to this tool and need help getting setup or even a walkthrough on how to use it please let us know and we will schedule a quick call/video chat to make sure you feel supported. Google Docs: We will use these as needed for collaborative efforts. Specific links will be posted here as well as in Slack when appropriate. Meeting Notes: This Google Doc is where we will keep a running record of our meeting notes. It is a collaborative document on purpose so please feel free to contribute as you like. You can also download an iCal feed here to add it to your own calendar. Since there were no slides or anything I am just sharing the audio. The video isn’t much to focus on if not on the live call. Since there were no slides I am just sharing the audio. We want to provide an overall list of 30 suggested topics for each category when we open the public proposal process on July 9. Our goal to inform submitters from the start what type of content this advisory committee feels is important and looking. For the category you have been assigned please generate a list of 25 session topics. Think of it as creating what you perceive as a balanced agenda for your category. Use this Google Spreadsheet to complete the task. Instructions and examples are also included. Please make sure that we have received a professional photo and bio (1 short paragraph) written in the third person. We will use these on the conference website to share what the Session Advisory Committee is and who is serving on it each year. During this phase, the committee member’s role is largely one of support for the public proposal process. There are numerous ways this can be achieved. We are always looking to add new voices and perspectives to our educational lineup at the conference. Committee members are encouraged to reach out to their own networks and communities to encourage others to participate in the proposal process. We have also put together a few resources to help with any promotional efforts. As part of our community-driven process, we offer a couple of opportunities for support to those developing session proposals. Committee members are invited to join and participate in any and all of these activities but it is not a requirement. We’ll hold a webinar-style community call to share information around the process and timelines for public submissions of session proposals. A recording and copy of the slides will be posted here after the event. Ash Shepherd, NTEN Education Director, and other veteran NTEN community members will hold drop-in office hours in an open video hangout to be available to offer support and answer questions. Community members are encouraged to join our online proposal prep group (Link Coming Soon) to request and provide feedback on their proposal drafts during the session submission period. The following are some general resources you can point folks to (or review yourself) for general information during this phase. It is perfectly appropriate for members of the Session Advisory Committee to submit session proposals. In addition to being engaged volunteers, members are thought leaders within the NTEN community and are encouraged to share their expertise. You can learn more and submit proposals here. You have a total of 30 votes you should cast overall. Think of it as if you were selecting the overall agenda of 25 sessions for your category. You can always reference the Suggested Topics List but you are not obligated to only vote for items on that list. Vote for what you think will make the best overall agenda. Categories: you will need to expand the “More Search Options” to filter down the list to see only your assigned category. The following is what we shared with the public during the proposal stage in terms of what elements the Session Advisory Committee would be using as a lens when reviewing during the voting stage. Your efforts go a long way to allowing us to create a balanced and inclusive agenda. Is the proposal content of current interest or on an emerging topic? Does this proposal support NTEN’s commitment to diversity, equity, and inclusion? Has the proposal content been implemented? Is the proposal an innovative solution, or does it offer a fresh treatment? Does the proposal address or support solving significant problems in nonprofit technology? Are the learning objectives clearly defined so that the audience knows what they’re leaving with? Do the session designer and speaker(s) have expertise on this topic? If after voting you feel there are particular topics you feel are critical to include but are missing you can add them to the “Missing Topics” document. This will be considered as we build out the final agenda and prepare to send out notifications. 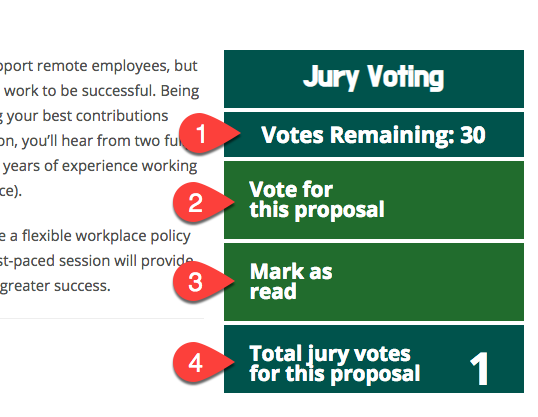 All your activity (voting and commenting) is only visible to members of the Session Advisory group. It is in no way visible to the public. All voting activity happens on the nten.org website and using your regular login account. If you run into any issues with this send us an email and we will make sure you are taken care of. Select this button to vote for a particular session. Clicking on it will also remove your vote. This is the total votes for this proposal. This does not reflect public voting, only votes from members of the Session Advisory Committee. The list views (all proposals tab and search results) have been randomized but your personal randomization is cached via a cookie. This allows you to see the same view each time you return as well as not give preference to proposals based on time submitted, alpha sorting, etc. Icons: In list views, you will see a thumbs up icon for proposals you have voted for and a checkmark on proposals you have marked as read. What am I required to complete? You are to cast twenty-five votes for sessions within your assigned category and five additional “wild card” votes wherever you like. Can I vote for my own session? Yes, while your vote certainly carries a bit more weight as a member of the Session Advisory Committee than if you were just in the public voting there is still enough volume to balance out any unfair advantage. Can I vote on sessions outside my assigned group? Yes, you have been allotted five “wild card” votes that you can cast outside your assigned category. Deadline Sept 14: We would like all Session Advisory voting to be complete by Sept 15. Sooner is always fine but at that point, we will be building out the aggregate scores and agenda working towards the Sept 28 deadline for public notifications. In order to keep the results private for the Session Advisory group, you have been given a different user role within the system. This means that while you are logged in you will be able to vote and see aggregate votes for the Session Advisory voting but will not see the overall results of the community voting activities. We want your voting to be independent of public results. In the instance where there are similar sessions that both receive a high level of support, there is a possibility of merging the sessions. In order to avoid confusion, this process is done in a way that manages roles and expectations. Each session receives a final score/rank. This is accomplished by aggregating the score across all voting groups (Community 60%, Session Advisory Committee 40%). Each group is given a different weight to reflect our values of making this process as community-driven as possible. Please see the Monthly Calls section for a recording of the call where we walked through the process. Yes, we are going to say thank you again for sharing your time, expertise and insights as we work to create an amazing educational program for the 19NTC event. Your efforts help us stay true-to-course in making the community the primary focus of our work. At this point in the process, your official commitment as a committee member has been fulfilled. Moving towards the event we will continue to periodic updates as a matter respect for the effort you put in to get us to this point and information for regarding registration. The following are a number of opportunities we will update you about as a matter of interest with no action required as part of your membership on this committee. We will continue to share periodic updates as a VIP back channel as valued members of our community and contributors to the development of this event. Once we identify any critical topics not covered by public submission or encounter dropped sessions we will share updates in case you know of a good resource we should invite to present. Each year we have a number of sessions that for a wide variety of reasons are looking for a secondary speaker. We will share a link here (Coming Soon) when the public-facing resource is opened up in case you want to point others to it or engage yourself. Specific details and instructions will be added to this section as we get closer to this phase.